Just in time for the Super Bowl, three retired NFL linebackers are pleading with parents to keep younger children out of tackle football to avoid traumatic brain injuries. The retired players, Nick Buoniconti, Harry Carson and Phil Villapiano, are recommending flag football for children under 14 as a way to protect their brains at a time when they are undergoing enormous growth. They made their appeal as a new study found evidence of degenerative brain disease in four teenagers who had suffered sports-related head injuries before they died. Autopsies of their brains showed early evidence of chronic traumatic encephalopathy, or CTE, the disease increasingly being diagnosed in football players, even without signs of a concussion, according to the study’s lead investigator, Dr. Lee Goldstein. The linebackers appeared with Goldstein to launch the “Flag Football Under 14” campaign on behalf of the Concussion Legacy Foundation at a news conference in New York two weeks ago. The Pop Warner youth football league and the NFL, which had long denied a link between football and CTE, responded by stressing what they have done to try to make the game safer. Pop Warner objected to what it called a ban on tackle football. Parents are worried about brain injuries. In a new NBC News/Wall Street Journal poll just released Friday morning, 48 percent of Americans said that they would encourage their child to play a different sport than football, up 8 percentage points from four years ago. An earlier poll, done by the University of Massachusetts, Lowell, Center for Public Opinion in July 2106, found that four out of five American adults do not believe tackle football is appropriate for children under age 14. That included 72 percent of the men surveyed. Buoniconti, a Hall of Fame middle linebacker and a two-time Super Bowl winner in 14 seasons with the New England Patriots and Miami Dolphins, has been diagnosed with dementia and likely has CTE. He said he regretted starting youth tackle football at age 9, which he called all risk with no reward. Now in a wheelchair, he struggled to express himself. Nick Buoniconti, the middle linebacker for the legendary Miami Dolphins, has dementia and likely has CTE or chronic traumatic encephalopathy. He is pleading with parents to keep their children from playing tackle football until they are 14 years old. With him, his wife, Lynn. Carson said he would not allow his 8-year-old grandson, Kellen Carson-Gurley, to play tackle football. His 11-year-old nephew, Brandon Dowling, decided on his own to forgo the sport, he said. The Centers for Disease Control and Prevention and the U.S. surgeon general should issue warnings to parents before they consent to their children participating, he said. “Whenever I spend time with my grandkids we play, we have fun but it’s about golf, it’s about swimming, it’s about non-contact sports,” he said. Carson, a Hall of Fame inside linebacker who played 13 seasons for the New York Giants, has depression and migraines and says he does not think as clearly as he used to. He would not have played football had he known about brain injuries, he said. Former NFL player Harry Carson attends the 31th Annual Great Sports Legends Dinner to benefit The Buoniconti Fund to Cure Paralysis at The Waldorf Astoria Hotel on September 12, 2016 in New York City. Dr. Julian Bailes, chairman of the Pop Warner Medical Advisory Committee, argued that there was no scientific proof that tackle football was more dangerous than other activities. No cases of CTE have been discovered in someone who played only youth football, he said, and in the study of the 202 deceased football players, the two who played only youth football did not show signs of it. “If you don’t have kids at football games or practice, they are not necessarily doing risk-aversive other activities,” he said. 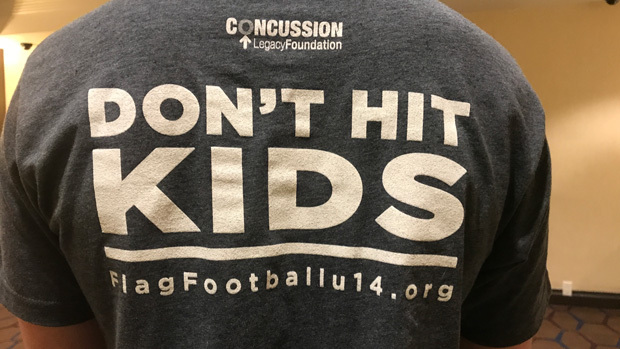 The Concussion Legacy Foundation, which has been researching brain trauma since 2007, picked 14 as a cutoff for tackle football because of the dramatic changes children’s brains undergo between 8 and 13. Critics charge the age is arbitrary. Nowinski also noted that not only are children’s brains maturing, but that their heads grow much faster than the rest of their bodies. To press home its point that youth tackle football is not only dangerous but unnecessary, the foundation put together a roster of top players who did not play until high school, a list that included Carson. According to the foundation, that list includes Jim Brown, Walter Payton, Jerry Rice, Lawrence Taylor and Tom Brady. Limiting children to flag football is among the responses to the increasing number of football players diagnosed with CTE, with such symptoms as depression, memory loss and dementia. Hall of Fame linebacker Junior Seau was found to have had CTE after his suicide in 2012. New England Patriots tight end Aaron Hernandez, who last year at 27 killed himself in prison as he was serving a life sentence for murder, had the most severe case of CTE ever found in someone his age, according to Dr. Ann McKee, a director at Boston University's CTE Center. Previously seen in boxers, CTE was first identified in football players by Dr. Bennet Omalu, beginning with former Pittsburgh Steelers player Mike Webster in 2002. Omalu says children who play tackle football are damaging their brains. “It's just a fact,” he said. 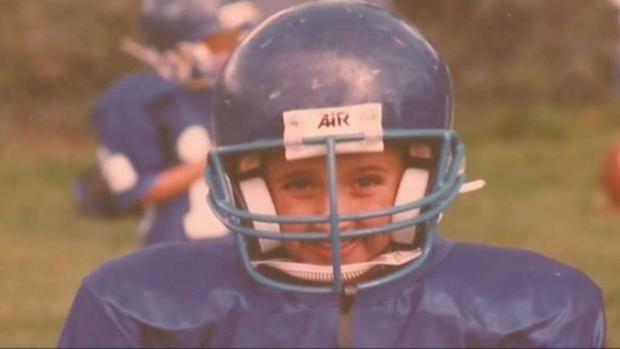 Some lawmakers are trying to ban tackle football for children altogether. Last week in Illinois, Democratic state Rep. Carol Sente proposed prohibiting children younger than 12 from playing. New York Democratic Assemblyman Michael Benedetto has been trying to get a similar measure passed. The new study, which was published in the journal Brain, examined the brains of four teenage athletes who had received closed head injuries one, two, 10 and 128 days before their deaths. Two died of suicide. Damage to the brain of one of the teenagers, a 17-year-old, qualified as early-stage CTE. Two of the brains had an abnormal accumulation of tau protein, which in CTE, forms clumps that spread slowly through the brain and kill brain cells. “This is really, very profoundly disturbing,” Goldstein said. The brains of four athletes of the same age who had not had recent head injuries did not show the same pathological changes, the research found. Earlier, McKee found CTE in the brains of 177 of 202 football players at all levels, and in 110 of 111 men who played in the NFL before they died. They ranged in age from 23 to 89 and had played in every position, from linemen to punters. And another study released by researchers at the CTE Center in September found an association between participation in youth tackle football before the age of 12 and impaired mood and behavior later in life. Those who played tackle football before age 12 had twice the risk of apathy or acting out and three times the risk of depression, according to the study. The higher risk was independent of how long the 214 participants had played football, the number of concussions they had or whether they played through high school, college or professionally. The researchers said they chose age 12 as the cutoff because in boys, the brain undergoes key maturation between 10 and 12. Researchers are still trying to determine how prevalent CTE is. They can detect it now only through autopsies — though they are working on identifying it in the living — and the brains donated for research did not represent a random sample. McKee has said that although researchers do not know the incidence among football players, that they could find as many cases as they have shows it is much more common than previously realized. Dr. Robert Stern, the director of clinical research at the CTE Center, said that it was important to understand concussions, to diagnose them and keep children off the field when they have them. But if the disease is associated not with the big hits to the head, but to the routine sub-concussive hits, that is not enough, he said. “Reducing concussions, or changing how tackling is done to avoid the big hits, is not going to get rid of the fundamental part of the game — which is getting your head hit, either directly with the helmet across the line of scrimmage or falling on the ground or getting by hit by a tackle and falling on the ground,” he said. All of those things are part of every play, they are the nature of tackle football, he said. The NFL and USA Football, the governing body of youth football, promote a NFL-funded program called Heads Up Football, which aims to reduce concussions by teaching safer tackling drills. The organizations said in July 2016 that the program had reduced concussions by about 30 percent and injuries by 76 percent, though a review by The New York Times found no demonstrable effect on concussions and less effect on injuries overall. USA Football responded that it had relied on preliminary data that had not been updated but later issued a statement standing behind the program. The Pop Warner football league also has eliminated kickoffs, reduced the amount of contact time to 25 percent of practices, banned full-speed, head-on blocking or tacking drills where players are lined up more than three yards apart and removes players with head injuries or suspected concussions from the field. Its Hill Country Pop Warner League in Texas participated in a USA Football pilot program called Rookie Tackle, a transitional program between flag football and 11-player tackle football. USA Football announced last year that it was introducing the new format, with smaller teams and smaller fields, among other changes. Whether a child plays youth tackle football should be an individual choice, said Bailes of the Pop Warner Medical Advisory Committee. What would it take to convince him otherwise? In particular, evidence that safety measures that Pop Warner has implemented are not effective and the discovery of CTE in someone who had played only youth football, he said. “There’s no convincing science that says kids shouldn’t play football if they want to,” he said. Pop Warner is facing a lawsuit brought by two California mothers, Kimberly Archie and Jo Cornell, whose sons played football as children. After their deaths, their brains were donated to Boston University’s CTE Center and both were found to have CTE. The lawsuit, filed in federal court in California in 2016, accuses the Pop Warner of negligence and fraud. Children playing organized tackle football is a relatively new phenomenon, Stern and others said. According to the Pop Warner football website, teams exploded across the United States in the 1960s, so that there were 3,000 teams by the end of the decade. Today, there are more than 5,000 teams. It started a flag football program in 1983, originally designed for teams on a tight budget. Another flag football program was begun by New Orleans Saints quarterback Drew Brees, who did not play tackle football until high school and whose sons play flag football. He and his marketing agent Chris Stuart, introduced a co-ed league called “Football ’N’ America,” in New Orleans, Carmel Valley, California, Nashville, Tennessee, and three other cities. It expects to expand to 20 to 25 markets, Stuart said. Brees told The Times Picayune that not only was he uncomfortable with his children playing tackle football until middle school or older but he saw the flag football league as a chance to save the game. The existence of flag football leagues is important if advocates expect to move more children into flag football, public health experts say. “We know that even under the best of circumstances, our capacity to make a difference in changing behavior is relatively limited,” said Sandro Galea, the dean of the Boston University School of Public Health. “If we’re serious about people having less exposure to head injury in the context of football, frankly what we need to do is not tell people to do something different, we need to change the danger itself and the danger itself is football and head injury,” he said. Matthew Myers, the president of the Campaign for Tobacco-Free Kids, notes that American society has upended its behavior as far as smoking, wearing seat belts and driving while drinking. He said he thought the United States was on the cusp of transformation again. An article in USA Today last year noted that while there has been a steady drop overall in participation, in some areas of the country, in the South in particular, it is holding steady or even growing. Florida added 1,252 more boys playing 11-man football this year than last, the newspaper noted. Daniel Durbin, a professor at the Annenberg Institute of Sports, Media and Society at the University of Southern California, said that the NFL has been most concerned with protecting its brand. The talk around the NFL used to be about the Super Bowl, now it is about concussions and brain damage, he said. “Regardless of the state of research, it just seems to me it is common sense to not drop a young kid off at a field and have them put a big helmet and face mask on that makes them a bobble head and not feel pain when they hit their head, and say, 'Go at it,'” Stern said.